The Library Foundation Gala is March 25th from 5 p.m. to 8 p.m.! 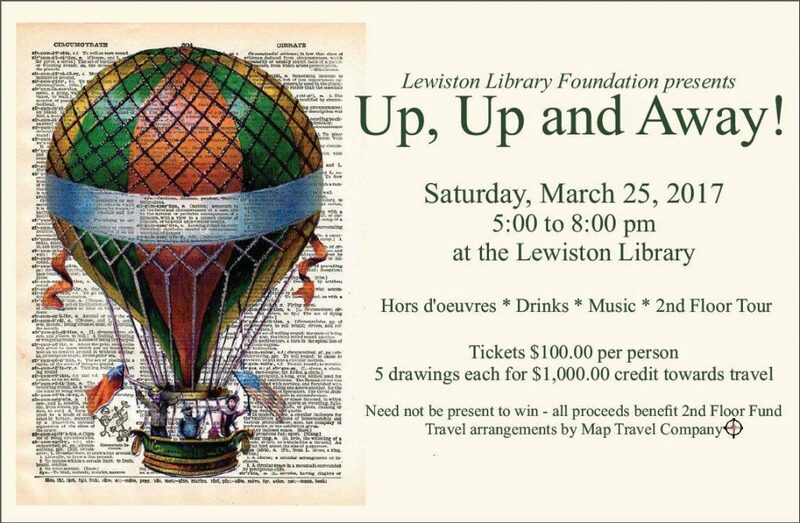 We are so excited that this year’s event will be at our own City of Lewiston Library. Please contact a board member of the Library Foundation for tickets! You can also buy tickets at the library, or by sending us a Facebook message. We can’t wait to go up, up, and AWAY to the second floor! Join us for a fun evening of hors d’oeuvres, drinks, music and a tour of the 2nd floor. Tickets are $100 per person. We’ll have 5 drawings for $1,000 credit towards travel from Map Travel.